Clicking on Project Management will allow you to edit / view project related information and project wide settings can be done from this section. Switch To: Switching to another project can be possible by selecting the desired project name. SVN URL: Shows SVN URL (if any) and used to check where the code resides. This is to be added by the user for informative purpose. Design URL: Shows Design URL(if any). This is to be added by the user for informative purpose to let the user know where the project design stays. Wire Frame URL: Shows Wire Frame URL, if any. This is to be added by the user for informative purpose. Physical Record Feature: By default, it allows to delete physical record from the database. This can be turned off by clicking green button and confirming the the message. Is Localized: By default, it allows local DB and API to store local data of the App. This feature can be turned off. Is Multi-Lingual: By default, the app is in single language only. Turning the app to multilingual is possible from this option. Changes will reflect once you logout from the Admin panel. Navigation Position: Navigation position can be either Vertical or Horizontal. By default, its vertical. Login Callback Required: After login if user wants to perform any operation then user has to set it Active and need to provide the function to be followed in the textbox given with. The function definition will be in PHP functions. Download DB : Explained at the end of the section in detail. Download Config : Explained at the end of the section in detail. Update Preview : Explained at the end of the section in detail. Database Name : This displays the name of the database in the project. Database Driver : This shows the type of the database it is i.g. MySQL, SQL Server etc. Database Server : Name of the database server. By default, it’s Configure IT. When you deploy the project, it will change the name here. Project Version: It shows latest version of the project. Project URL: Default Project URL is of Configure.IT server till its deployed on client server. It will be created automatically at the time of project creation. Admin URL: Default Admin URL is of Configure.IT server till its deployed on client server. It will be created automatically at the time of project creation. API Console URL: Default API URL is of Configure.IT server till its deployed on client server. It will be created automatically at the time of project creation. Remote Servers List: This will show the list of servers you are hosting the project on. There can be application server, database server, development/production server etc. If remote server is configured, all the changes in the application will be directly uploaded to your server with just one click! Resources Management: Explained at the end of the section in detail. Theme Management: Explained at the end of the section in detail. Share Project: To share the project with someone, select Access Type and Access Rights. Access Types can be either Public or Private. Enter email address to share and give rights like View or Edit. CDN Server? : CDN Server means any third party server, and it is used for assets only. If user selects CDN Server then he needs to provide CDN Server URL. Then whenever assets (images, JS and CSS) will load, it will come from that CDN Server. Update : This will save the updated changes. 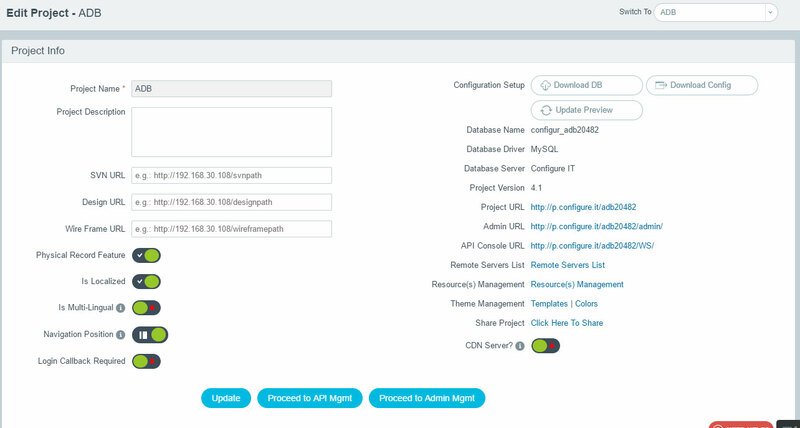 Proceed to API Mgmt : This will redirect to API Management Section. Proceed to Admin Mgmt: This will redirect the user to Admin Management Panel. If you have subscribed for the inclusive package then you are allowed to download DB. 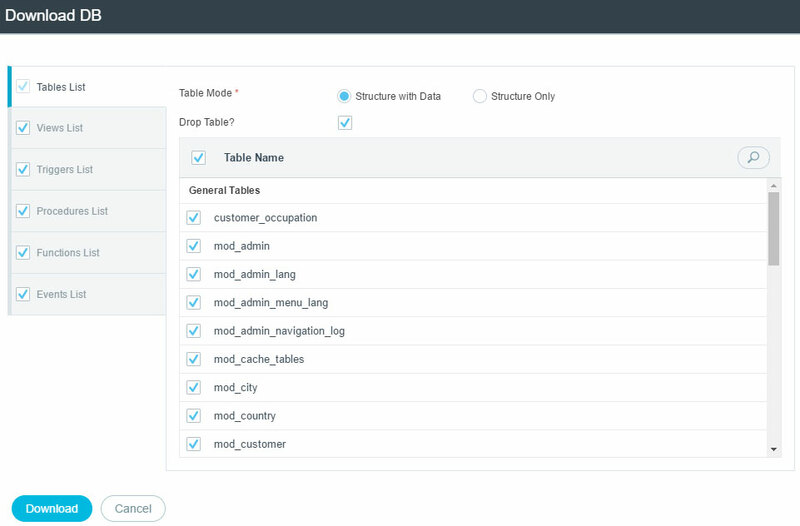 Select Tables, Views, Triggers, Procedures, Functions and Events to be downloaded. DB will be downloaded as SQL file. If you want to download the configurations made by you either in the whole project or in DB or in Assets or in General PHP, you can download it anytime, if you have subscribed for. This will protect against losing of any data and the same code or data / configurations can be used in any other project. User can select what to export and clicking on “Export” will download selected configurations in Zip file in your computer. It replaces the current version of the project with the latest version. If your project is deployed or downloaded, then act carefully before downloading latest version as by performing this action, you will lose earlier data. It shows you information like current version of the project and latest version available of the project. It also shows the list of available version from which you can select the version to replace. Clicking Update will update the preview of the project. Redirecting on this panel will show you all the resources used in the project. All the resources are well-arranged in folders. Edit file, make duplicate or rename it. Create archive and extract files from archive. After selection of the template is made, to customize it, user can visit Custom Settings. 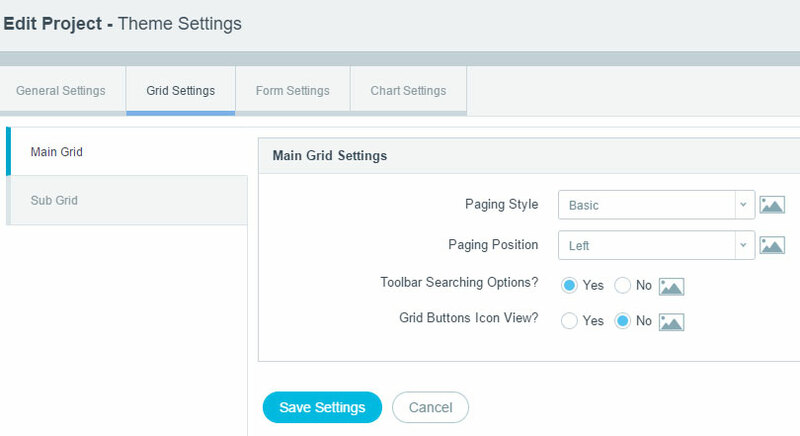 Customized settings can be done for General Settings, Grid Settings, Form Settings and Chart Settings. Clicking on icon beside the dropdown will show you examples of each options. Row View: How much Row space you want to leave. Select from Single Row and Double Row. Bordered Rows: If you wish to distinguish each row by border or keep it plain. Default is plain view. Label Alignment: If Labels are to be left aligned or right aligned. Show Title Bar: If you want to show the form with title bar or without it. Show Action Buttons Bar: If the action buttons are to be shown in separate bar or not. Default is without Bar. Action Button Alignment: Action Buttons can be aligned to the right, left or keep it in the centre. Show Action Controls: If you want to show Action controls above Action Buttons or not. Action Controls decides what user wants to do e.g. Next, List, Stay etc after pressing Action Button. Next: Will open the next record for adding or editing. List: Will list all the records. Stay: Will make the changes and stay on the same page. 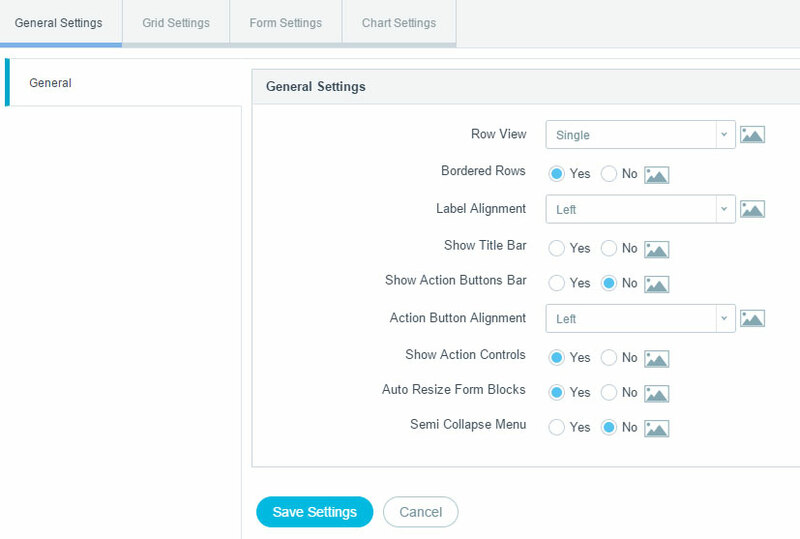 Auto Resize Form Blocks: Activating this option will keep all the blocks uniform. By default, the option is activated. Semi Collapse Menu: If this option is active, user can view submenu just by hovering mouse over it. Paging Style There are two options like Basic and Numbers: Basic will show current page and total pages while Numbers will list some number of pages to be selected from directly. Paging Position: Paging can be placed either at left side or at right side. Listing Filtration Mode: Listing Filtration should be given or not. Default is Yes. Toolbar Searching Options? : You can select how to consider URL Parameters, if to be considered always or only on Load or Never. Grid Buttons Icon View? All the Grid Action Buttons are to be shown with full description or just Icon View. Default is with description. 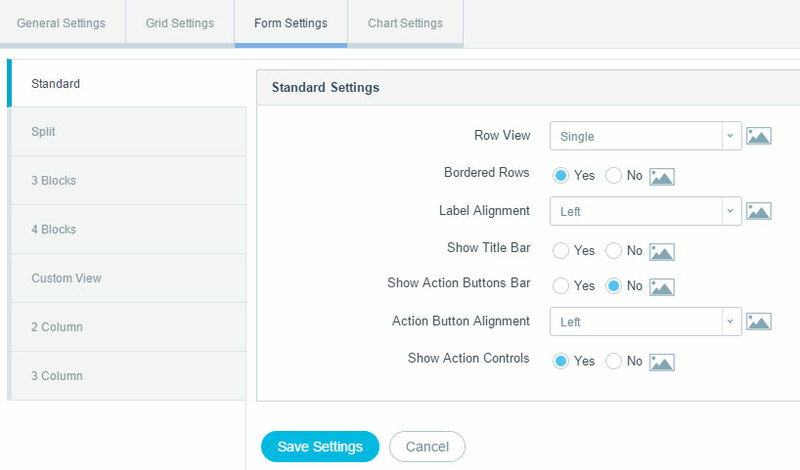 Same settings as above will be applicable for various forms such as Standard, Split, 3 Blocks, 4 Blocks, Custom View, 2 Column and 3 Columns. 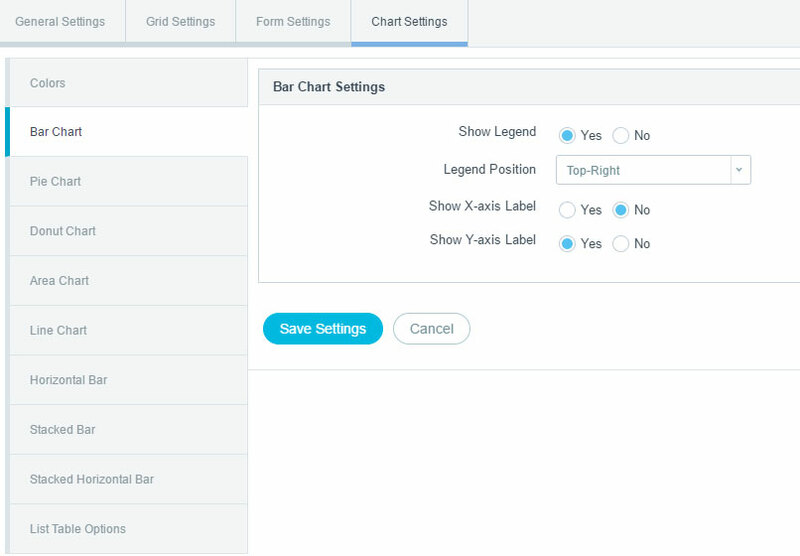 Colors: Here you can set which colors are to be used in a Chart. 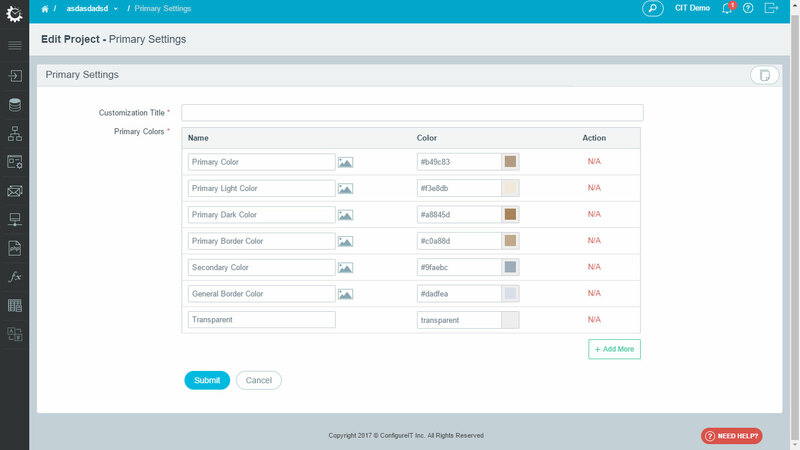 Either you can select from the color panel or directly enter the color code as shown in below screenshot. Show Legend : Decide if you want to display the Legend for the chart or not. Legend Position : If you want to display the Legend, select its position from Top-Left, Top-Right, Bottom-Left and Bottom-Right. Show X-Axis Label : If you want to display X-Axis Label or not. Show Y-Axis Label : If you want to display Y-Axis Label or not. Show Label : If you want to show Label or not. Label Style : If you want to display the Label, you can select from multiple Styles available in the list. List Table Options: This shows how many records do you want to show in a List for page. “Submit” button will save the color configurations for this particular project.